origami-two swans, originally uploaded by Fran Levinson. 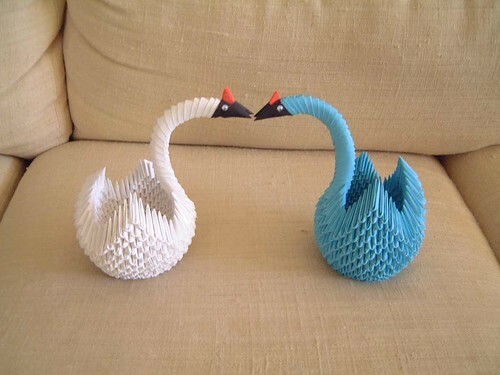 Swans are traditional Chinese Origami sculptures that may be given as gifts to newlyweds. They represent a long and happy life together. Creating various animal sculptures enabled me to become more and more familiar with the techniques of building with Chinese Origami Units. Swans may have 500+ pieces, depending on size, and are built by starting with a base formed into a circle and built upon as one complete unit.